When “The Great One” and “The Finnish Flash” think you’re something special, you must be doing something right. Although it’s less than 10 games into Patrik Laine’s NHL career, it’s easy to see why a pair of hockey legends would think that way. In Winnipeg on October 22 for the NHL Heritage Classic, an outdoor exhibition game between Edmonton and Winnipeg alumni, Wayne Gretzky, who captained the Oilers squad, and Teemu Selanne, who led the Jets side, both took turns raving about an 18-year-old rookie who’s already turning heads - including theirs. Laine, selected second overall in the 2016 NHL Entry Draft, has generated plenty of buzz, ignited by a three-goal performance on October 19 in a 5-4 Winnipeg home victory over Toronto, in which Laine netted the tying goal, overtime winner, and First Star honours. "I decided to shoot and it just went right where I wanted. 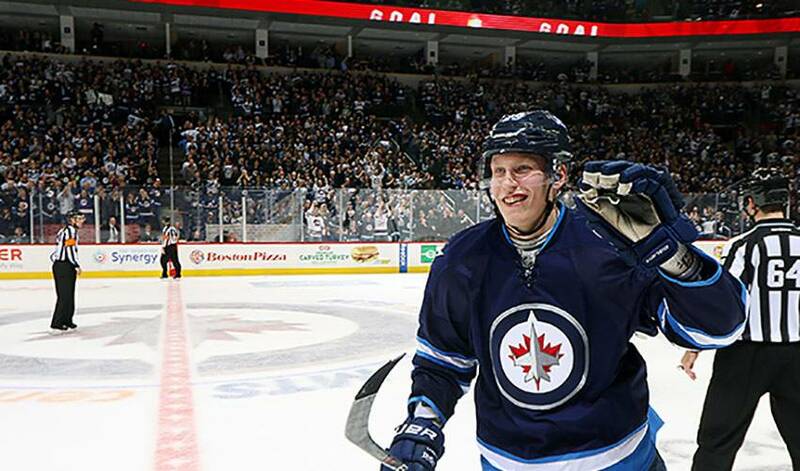 Amazing feeling," said Laine of his game-winning tally. "It's always nice to score. It's the best thing in the world." And something Laine happens to be very good at. His answer comes as no surprise to most when asked what his best on-qualities are. It’s what he did with Tappara Tampere of the Finnish Elite League in 2015-16, a season in which Laine lit the lamp 17 times in 46 games, accompanied by 16 assists. In 18 playoff games, he had 10 goals and 15 points. As noted on eliteprospects.com, "Laine has the hunger to create chances on his own from the wing and actively looks for and creates opportunities to use his shot. His elite wrist shot is notable for its quick release and his powerful one-timer from the top of the circle is a constant threat on the man-advantage." He’s also drawn comparisons to Selanne, who wowed Jets fans with 76 goals and 132 points (both league records) over 84 games in 1992-93. On October 21, he was given the key to Winnipeg by the city’s mayor, Brian Bowman. Despite his own early successes, Laine is hungry to contribute more, committed to not being a flash-in-the pan. And even words of praise from two of the sport’s most accomplished offensive superstars won’t sidetrack the 6’5”, 205-pounder in his quest to raise the bar each time he steps on the ice. While he’s already showing the accuracy scouts continually raved about, Laine was a little off the mark on draft day when he assessed how the start of his NHL life might play out. There are plenty of people, including a pair of hockey icons, who would happily tell Patrik Laine otherwise. After receiving a party invitation from young Lucas Bydak by way of Twitter, Laine made sure he made a belated birthday visit as soon as he could.